Captain Cook’s casino has been in the online casino space since the year 1999. and uses Microgaming’s Viper software. The casino has a downloadable and instant play casino, with the former offering over 220 games. The games on the site include 24 Gold Series Games, 21 of which are blackjack games. It offers some 35 different blackjack games 7 multi-hand games (Double Exposure, Spanish 21, Bonus Blackjack, Atlantic City, Vegas Strip, Vegas Downtown and Classic Blackjack). You can also play the standard table games, which include Baccarat, Cyber stud Poker, Three Card Poker (multi hand), Craps, Red Dog, Sic Bo, Poker Pursuit, Casino War and Keno. The poker games on offer at the casino include 8 Power Pokers, 9 10-Play Power Pokers, nine 50-Play Power Pokers, eight 100-Play Power Pokers and fifteen different standard video poker games. The casino has a sign up offer bonus, offer new players $500 in free credits to play for sixty minutes. At the end of this time period, if you have made at least 100 bets and earned a sum of over $20, (above the original $500), the amount will be credited into your real account. You can transfer a sum of up to $200, but this sum must be played through 30 times. 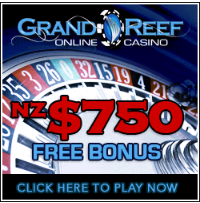 If you are looking for big jackpot payments then Captain Cook’s Casino is a good place to go. Its jackpot is normally over $8 million and it features three favorites, “Mega Moolah”, “King Cashalot” and “Major Millions”. The site is credited for being the place where a player first became a millionaire, when he won the sum of $1.6 million playing “Major Millions” in 2002.